In peace, we go from forcing to inviting. From strain to ease. And from conflict to coming together. We take the leap of radical faith and see the proof in the results that are so much more than we imagined. We decide that anxiety and pain, stress and drama are no longer serving us. We decide instead to choose confidence, clarity and consciousness. There’s another way. 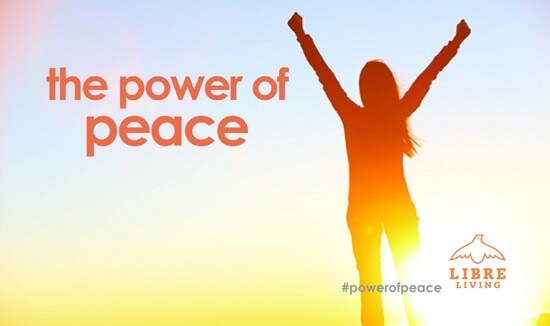 Some of you know that over the past few weeks I’ve been receiving a lot of messaging about the power of peace. I’ve been sharing it, too. 1. Enter your info here–so we can contact and send you the prize if you win. 2. Like the Libre Living Facebook page. 3. Answer the question posted there–in the comments below. Contest runs till midnight PST this Monday. What brings me peace? Quiet, early mornings spent in my meditation seat and doing my asana practice. I relish the time to myself before the rest of my house wakes up.